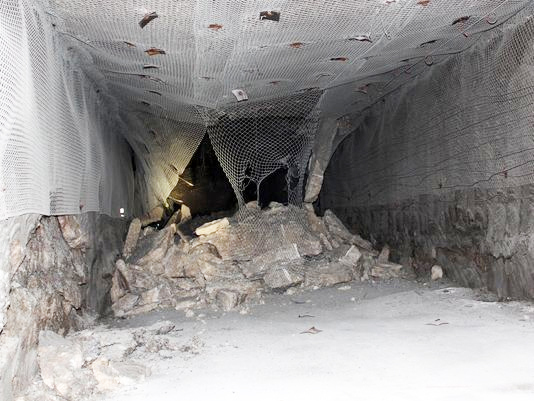 One of two deep-underground tunnel roof collapses that recently caused evacuations of the military radioactive “Waste Isolation Pilot Plant” in New Mexico. Photo: Energy Dept. On Jan. 4, 2017, the Department of Energy (DOE) reopened its Waste Isolation Pilot Plant (WIPP), which had been closed since a barrel of radioactive waste stored there exploded in February 2014. The New Mexico facility is the only one accepting transuranic waste (including contaminated tools, clothing, gloves, soil, and debris) from the federal sites involved in nuclear weapons production, and its 35-month closure has caused a backlog of packaged waste to pile up above ground at cleanup sites across the country. When the DOE opened WIPP in 1999, it touted the underground site as a “permanent” storage facility for military radioactive waste that would “start clean” and “stay clean.” Now, significant portions of the site are permanently contaminated and workers have to wear respirators and protective clothing. The ventilation system which was damaged by the radiation release following the 2014 explosion is operating at a fraction of its original capacity; the DOE is replacing it with a new system expected to be ready in 2021, at an estimated cost of $350-400 million. Citizens’ and environmental watchdog groups have expressed concerns about whether the site is safe to reopen. The Mine Safety and Health Administration released a report in December warning that underground conditions have deteriorated significantly while the site was closed. The salt deposit that encloses the storage area contracts by as much as six inches per year, and keeping the dug-out waste rooms intact requires constant structural maintenance, which has been significantly interrupted by the 3-year closure. In December, New Mexico-based groups Citizen Action New Mexico and Concerned Citizens for Nuclear Safety filed a Freedom of Information Act (FOIA) request with the Energy Department asking for documents related to preparations for reopening WIPP—including any financial incentives promised to the Nuclear Waste Partnership, the contractor that runs the facility, for speeding up the process. The DOE denied the groups’ request for an expedited return of FOIA information and they are appealing, citing a lack of transparency surrounding the reopening. While DOE officials have denied that bonuses are tied to the reopening, a 2017 Department of Energy Performance Evaluation and Measurement Plan for WIPP says the contractor could receive more than $2 million for reopening and another $2.1 million for completing a waste placement milestone within the first 90 days of resumed operations. In fiscal year 2016, Nuclear Waste Partnership received $11.2 million (around 72%) of a possible $15.5 million in bonus funds. According to ARS Technica, the Times reported in 2016 that the DOE added $640 million to the contract for direct cleanup costs after the accident, which does not include the ventilation system replacement or the added price of keeping waste above ground at clean-up sites around the country over the past three years. Over 10,000 public comments are gone; detailed explanations of the integrated waste management and interim storage facilities have vanished; and videos from the eight public meetings held in 2015 and 2016 are nowhere to be found. There is nothing but those two sentences. Just like there is nothing about consent-based siting in the 2018 federal budget proposal issued in April. The Department of Energy began the consent-based siting process in 2015 after withdrawing its license application for construction on Yucca Mountain in 2010, a project that was widely unpopular in Nevada. The DOE held eight meetings in different cities across the US to discuss how they should go about siting more than 70,000 tons of nuclear waste created from nuclear energy production and nuclear defense programs. In the feedback the DOE received from those meetings and an open comment period, many nuclear activists and concerned citizens expressed their doubt that any such process could truly have the consent of every person affected by the nuclear waste repositories and interim storage facilities. Others said that the nuclear energy companies along with the department of defense, and not the community members whose well-being could be directly affected by the hazardous waste, should bear the brunt of the cost and effort needed to safely store the hazardous material. And yes, Yucca Mountain may hasten federal government’s ability to fulfill its obligations, and it could reduce taxpayer burden, a burden that has been increasing since 1998 when the government began paying damages to nuclear energy companies for continuing to store spent nuclear fuel on-site. But it is just as likely that it will waste time, energy, and money on a site that has already been deemed unsafe and untenable. Above all though, it shows the Trump administration’s willingness and eagerness to disregard public input and to ignore the political and ethical implications of such a move. It shows its willingness to act without consent. —Elena Hight is a Ph.D. candidate in sociology at the University of Wisconsin, Madison. The first unprecedented and controversial shipment of high-risk, highly radioactive liquid waste from Canada arrived at the Savannah River Site (SRS), according to the Defense Nuclear Facilities Safety Board (DNFSB). The handling of the first armed convoy faced problems at SRS due to inadequacies in a container designed to shield workers from radiation. A DNFSB report found that, “After loading …, radiological protection (RP) [personnel] identified an unexpected hotspot on the side of the pig indicating that the pig was not providing adequate radiological shielding. RP labeled the hotspot before H-Canyon personnel relocated the pig so the hotspot would be facing the wall. H-Canyon personnel did not identify any similar issues on the other pigs and are planning to use the one spare ‘pig’ for future evolutions,” ‘pig’ being an in-house term for the outer hauling container. 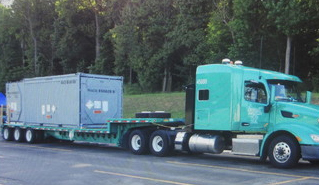 A truck and a container like the one used in an unprecedented high-risk experimental shipment of high-level radioactive waste in liquid form from Chalk River, Ontario to Savannah River, South Carolina. In response to the report of faulty shielding of workers from radiation exposure, SRS Watch filed a Freedom of Information Act request for more information. The waste is from medical isotope production at Chalk River National Labs in Ontario, and contains a host of highly radioactive fission products. Once processed to remove uranium in the 61-year-old “H-Canyon” complex, newly resulting waste is to be dumped into nearly antique waste tanks at SRS. The Canadian liquid waste consists of about 6,000 gallons stored in the so-called Fissile Solution Storage Tank at Chalk River, and is to be shipped using up to 150 overland transports via unspecified routes from Canada to SRS. The US Energy Department kept this first shipment secret, as well as the radioactive hotspot that was discovered on the shipping cask, but watchdog groups alerted the press and public. In February this year, environmental groups including SRS Watch, Beyond Nuclear and the Sierra Club lost a federal lawsuit urging DOE to prepare a full Environmental Impact Statement on the shipments. The court found no need for an in-depth analysis of transport risks, impacts of processing and disposal at SRS, or alternative methods of managing the waste in Canada. The groups argue that doing the “downblending” of the highly enriched uranium in the liquid waste in Canada, and then solidifying it there, is the best option from nuclear non-proliferation and environmental perspectives. This government-backed downblending option has been proven viable with the processing of similar liquid nuclear waste in Indonesia. “The incident with the handling of the Canadian waste on its arrival at SRS gives the … team a black eye for flubbing the very first shipment after years of preparation,” Clement said. Three of the six reactors at Japan’s Fukushima-Daiichi complex were wrecked in March 2011 by an earthquake and tsunami. The destruction of emergency electric generators caused a “station blackout” which halted cooling water intake and circulation. Super-heated, out-of-control uranium fuel in reactors 1, 2, and 3 then boiled off cooling water, and some 300 tons of fuel “melted” and burned through the reactors’ core vessels, gouging so deep into underground sections of the structure that to this day operators aren’t sure where it is. Several explosions in reactor buildings and uncovered fuel rods caused the spewing of huge quantities of radioactive materials to the atmosphere, and the worst radioactive contamination of the Pacific Ocean ever recorded. Fukushima amounts to Whole-Earth poisoning. Now, researchers say, radioactive isotopes that were spread across Japan (and beyond) by the meltdowns will continue to contaminate the food supply for a very long time. According to a new study that focused on “radiocaesium” — as the British call cesium-134 and cesium-137 — “food in japan will be contaminated by low-level radioactivity for decades.” The official university announcement of this study neglected to specify that Fukushima’s cesium will persist in the food chain for thirty decades. It takes 10 radioactive half-lives for cesium-137 to decay to barium, and its half-life is about 30 years, so C-137 stays in the environment for roughly 300 years. This phraseology deliberately conveys a sense of security — but a false one. Asserting that low doses of radiation pose no “significant” health risk sounds reassuring, but an equally factual framing of precisely the same finding is that small amounts of cesium in food pose a slightly increased risk of causing cancer. A radiation disaster, worse than the 2011 Fukushima-Daiichi catastrophe in Japan, could hit the United States because of ignored risks, according to a startling new study from Princeton University. The US Nuclear Regulatory Agency (NRC) has greatly underestimated the risk of major radiation releases from a reactor waste fuel fire. Such reactor fuel fire could erupt in the event of a “station blackout”—the loss of off-site and emergency electric power—and the consequent boiling off of cooling water in waste fuel pools. The wrecked waste fuel pool at Japan’s Fukushima-Daiichi reactor No. 3, pictured in March 2013, two years after hydrogen explosions destroyed its outer shell. Frank von Hipple, a nuclear security expert at Princeton, and the historian Michael Schoeppner, are the study’s coauthors. The dispersed radioactive contamination from such a fire “would be an unprecedented peacetime catastrophe,” the authors conclude in their paper. Von Hipple and Schoeppner argue that the NRC’s gross minimization of risk is the result of corporate and political interference. “The NRC has been pressured by the nuclear industry, directly, and through Congress, to low-ball the potential consequences of a fire because of concerns that increased costs could result in shutting down more nuclear power plants,” von Hipple told Science Daily. “We’re talking about trillion-dollar consequences,” he said. Waste uranium fuel rods, often called “spent fuel,” are kept in cooling pools near reactors for several years. Although still very hot, they can then be moved into so-called “dry cask” storage. 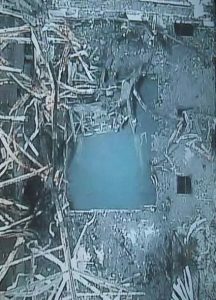 While nuclear reactors themselves have emergency, back-up generators to circulate cooling water inside the “reactor core” (these generators were wrecked at Fukushima), US waste fuel pools do not have back-up, emergency power. The pools are especially vulnerable to station blackouts. Cooling pool water is normally pumped from a nearby lake, river or sea, and must constantly circulate and cover the waste fuel, which is the hottest and most radioactive material in the commercial nuclear industry. (Waste fuel from Navy propulsion reactors is reportedly more deadly.) Any loss of on-site electric power—like happened at Fukushima—can stop cooling water circulation, causing the water to boil away, and expose the fuel rods. Such loss of coolant can ignite a fuel fire and cause catastrophic amounts of radiation to be released. 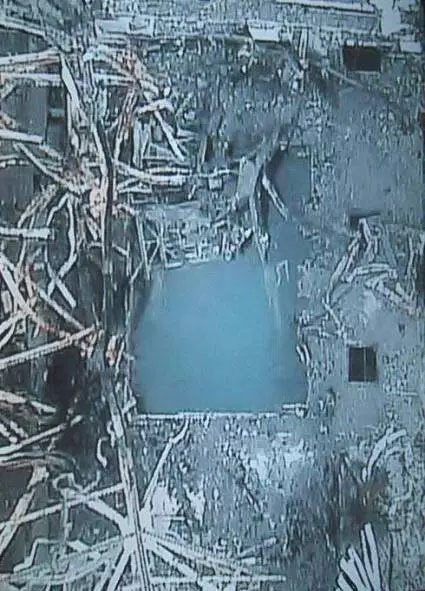 The world watched dreadfully in March 2011 as the station blackout at Fukushima-Daiichi threatened to cause this sort of fuel fire. The earthquake and tsunami cut off all cooling water-pumping and circulation. At a congressional hearing March 16, 2011, six days into the triple meltdowns, the head of the NRC, Gregory Jaczko, said in a Congressional hearing in Washington that all the water was gone from one of Fukushima’s waste fuel pools. Although Jaczko was mistaken, the nightmare was possible, likely even, and observers counted the hours until cooling water boiled off and a fuel fire would ignite. 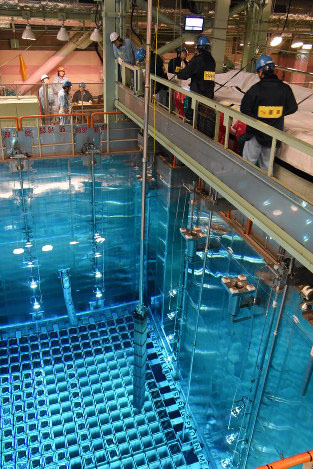 An in-tact cooling pool in Japan, with one “assembly” of waste fuel rods being moved in the 20-foot covering of water which keeps the hot irradiated uranium from catching fire. The NRC has estimated, for example, that a major waste fuel pool fire at the Peach Bottom station in Pennsylvania would force the evacuation of 3.46 million people from 12,000 square miles, reports Richard Stone writing in Science magazine May 24. But the Princeton researchers, who say they used a better computer modeling system, estimate that such a disaster would force 18 million people to evacuate from the surrounding 39,000 square miles. Von Hipple’s and Schoeppner’s report followed, by only one week, a study from the US National Academies of Sciences that urges the United States to make improvements at its waste fuel pools. The NAS’ study recommends that the NRC and reactor operators upgrade monitoring of the waste pools—most do not even have a waste pool water-level monitor in the operator control rooms!—and improve the means of topping up water levels during an accident. Another way to reduce the risk of waste fuel fires is to hurry the transfer of fuel from the cooling pools to dry casks. “As recently as 2013, the NRC concluded that the projected benefits do not justify the roughly $4 billion cost of a wholesale transfer. But the national academies’ study concludes that the benefits of expedited transfer to dry casks are five-fold greater than NRC has calculated,” Stone reported in Science.